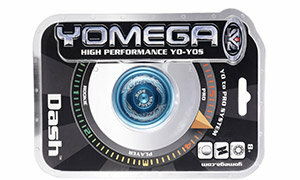 Description: The Yomega Dash is a high performance yo-yo. It is a wing shaped yo yo made from anodized aircraft grade aluminum. The design features a weighted perimeter, and a standardized C ball bearing with internal silicone response pads. The Dash has been upgraded with new laser etched graphics. This yo yo provides the player a high end experience at an affordable price. The Dash yo yo plays like a yo yo twice its price. The hardest part is choosing which color. Product icons let you know that this is a metal yo yo in the most popular wing shape with a C sized bearing. The Yomega Dash is based on Yomega's best selling Maverick. It features a wing shaped body design and high grade steel ball bearing. Designed for high speed spins, the Dash is the perfect choice for learning how to master advanced string tricks. It is a little heavier than the Maverick and a little bit bigger in the hand. Whether you are trying to master Double or Nothing, Atom Smasher or any other trick, this is the yo-yo for you. The Dash's aluminum alloy body, weighted perimeter and smooth return system make this the best choice for yo-yo players looking to take their skills to the next level. Less responsive and with longer spin times, the Dash requires a bind to bring the yo yo back to hand. Yomega has taken the mystery out of buying yo yos. Each yo yo in the Yo to Pro system is in a color coded package with a dial that indicates the amount of prior experience required to best utilize the features of each model. 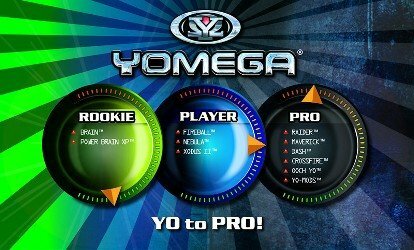 The Yomega Dash is a Pro level yo yo, meant for the experienced player, packaged in black. Feature Icons on the front of the package let you know the outstanding features of each model. The Dash is a wing shaped yo yo built of airplane grade aluminum with a "C" sized bearing. The Dash is available in two sharp colors - bright blue and deep red. The etching design is a tribal border pattern that makes the yo yo look great even when its standing still. 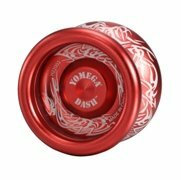 The Dash is one of Yomega's heaviest yo yos, which contributes to its long spin times: 66 grams. It is built with a silicone sticker return system, has a 3.5 mm gap width and a standard "C" sized bearing. The Dash has a 53 mm diameter and a 37.8 mm width. Any Yomega collection is enhanced with the addition of the new and stylish Dash. The Yomega Dash is packaged with extra string and collectible insert sheet. The Dash is a Pro level yo yo for the experienced player.